A group of priests has issued a plea to all the world’s bishops to “reaffirm Christ’s teaching” in the face of today’s “pastoral crisis” in the Catholic Church. Fifteen American and European clergy, including Father Gerald Murray, a frequent guest on EWTN’s The World Over program, highlight a resurgence of “gravely harmful moral errors” regarding the feasibility of living Jesus’ teachings, the nature of conscience, and the role of the Church. The priests’ appeal, signed on April 22, Good Shepherd Sunday, comes after frequent statements and actions from some of the hierarchy, theologians and even Pope Francis himself which many of the faithful believe question or even openly contradict the Church’s established teaching and pastoral practice. “Christ’s life and moral teachings are thus presented as abstract ideals that must be adjusted to fit our circumstances, rather than as realities already attuned to free us from sin and evil in every situation,” the priests explain. 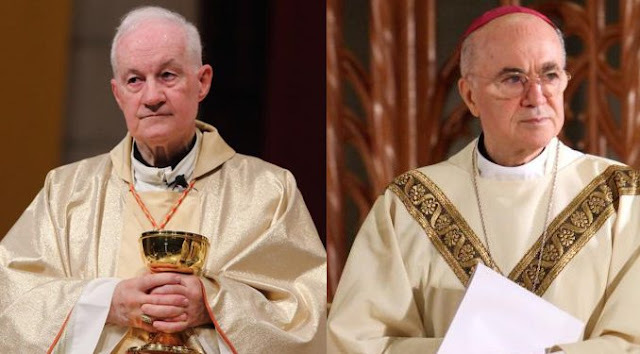 This latest appeal comes in the wake of literally daily scandals where the faithful are crying out to their priests and bishops about the apostasy and heresy in the Catholic Church. For example Cardinal Reinhard Marx, the Archbishop of Munich and Freising, criticised a mandate from Markus Söder, Bavaria’s Prime Minister, that all state buildings should display crosses by June 1st. This has German journalists scratching their heads, as when Benedict XVI was Pope, Marx protested when a politician said he WOULD NOT hang crucifixes in public buildings! 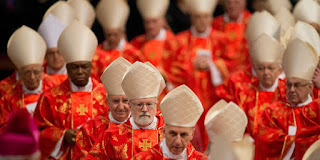 Are we seeing a pattern among this bishops and cardinals? Can we see how they blow wherever the wind that will bring them power blows? How do we reconcile such blatant, wilful, unapologetic hypocrisy in men who have the duty of spiritual care for millions of souls??? 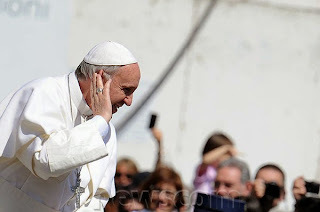 This comes after he and another German prelate HID their pectoral crosses on a visit to Jerusalem! The Cardinal also recently claimed that Karl Marx, father-of-communism unmistakably influenced Catholic social doctrine, adding that he was “impressed” by the Communist Manifesto. Karl Marx has often been referred to as the father of Communism, a political theory linked to the deaths of millions. Cardinal Marx, one of the council of nine cardinals chosen by Pope Francis to advise him, is at the forefront of pushing what is being hailed as a "new paradigm" in the Church that departs from previous Church teaching on sexual morality (here, here, and here) and marriage. As the news website of the German bishops Katholisch.de reports on 30 April, Cardinal Marx, the archbishop of Munich-Freising and president of the German bishops' conference, told the Frankfurter Allgemeine Sonntagszeitung that the Communist Manifesto “quite impressed” him. That declaratory document had been written by Karl Marx and Friedrich Engels and promulgated in 1848. 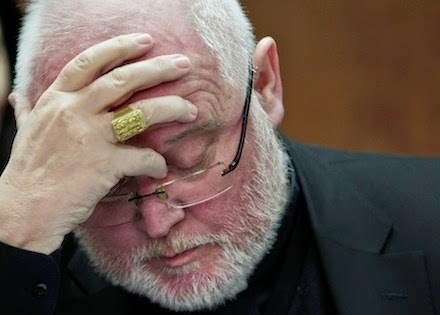 In another recent interview, Cardinal Marx admitted to finding the writings of Karl Marx “fascinating,” adding that the Communist Manifesto has “an energy” and “a great language.” “One only has to read Karl Marx without prejudice, then his power will surprise,” the prelate explained. “There is an inspiration, a revolutionary impetus,” he stated. Cardinal Reinhard Marx , and the Council Chairman of the Evangelical Church in Germany, the Bavarian Regional Bishop Heinrich Bedford-Strohm hiding their pectoral crosses. Speaking to an audience at Hochschule Heiligenkreuz, a pontifical university near Vienna (see this report), Archbishop Peter Stefan Zurbriggen said that speaking as a representative of the Holy Father, he was “really sad and ashamed that bishops and priests, of all people, have to criticise it when they want to erect crosses. “That is a disgrace which mustn’t be accepted!,” he said in a loud voice and to a round of applause. Let's face it folks, this is Our Lady of Akita's warning of Cardinal against Cardinal become reality before our very eyes! It is like civil war out there!